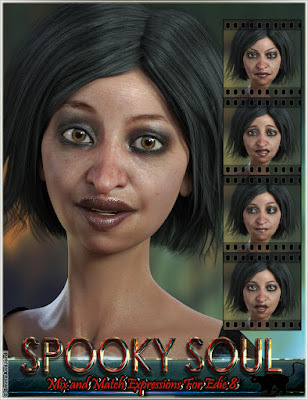 This is our new product for our Daz 3D store: Spooky Soul is a must have expression pack for Edie 8 and Genesis 8 Female(s), that consists in expressions organized in three folders (Full Face, Upper Face, and Lower Face), and you also have pose control ERC dials to apply each full face expression. This is our new product for our Daz 3D store: EJ Ethnic Male Beauty For Genesis 8 Male(s) is a collection of 42 custom sculpted morphs that shape your Genesis 8 to reflect a beauty ideal of 7 ethnic groups: Craig (African), Kamesh (Indian), Ichiro (Asian), Lorenzo (Latin), Kainalu (Polynesian), Cheveyo (Native American), and Tom (Caucasian). 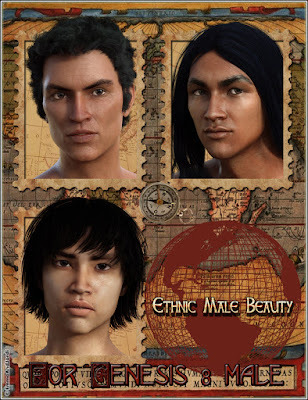 You can morph the full figure, or only the head or body, or mix and match the lips, eyes, and nose of each ethnics with the others to get unique looks, or create mixed ethnic characters. Add variety and customization to your renders with this morph collection, a must have for Genesis 8 Male! 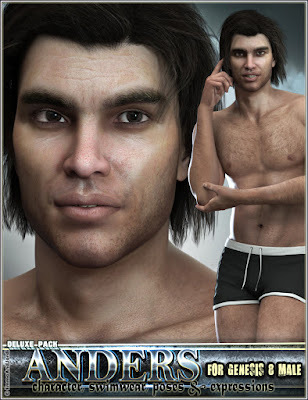 This is our new product for our DAZ 3D store: EJ Anders Deluxe Pack contains: a detailed character for Genesis 8 Male, an extremely versatile swimwear with lots of partial materials, 10 poses with all their partial poses, and 10 expressions for full face, lower face or upper face, and their dials. Get EJ Anders and enjoy endless hours of customization and versatility! 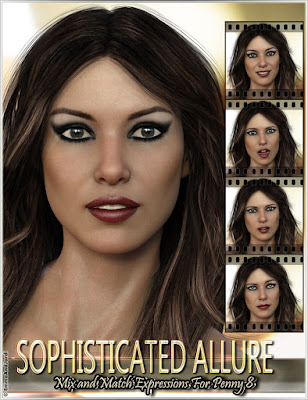 This is our new product for our Daz 3D store: Sophisticated Allure is a must have expression pack for Penny 8 and Genesis 8 Female(s), that consists in expressions organized in three folders (Full Face, Upper Face, and Lower Face), and you also have pose control ERC dials to apply each full face expression. This is our new product for our Daz 3D store: Cheeky Innocence is a must have expression pack for Aiko 8 and Genesis 8 Female(s), that consists in expressions organized in three folders (Full Face, Upper Face, and Lower Face), and you also have pose control ERC dials to apply each full face expression.